March 29, 2019 – With spring in the air, I find mornings especially wonderful. The air is crisp, plants and trees are springing to life, and there’s a general sense of renewal. It’s also a terrific time to give mindfulness meditation a try. This mental training revolves around focusing your mind on your personal experiences in the present moment. Breathing exercises, relaxing your mind and body, and increasing your awareness of both are all part of mindfulness meditation. A lot has been documented about the mental benefits of this type of meditation, and now it appears there are benefits for your body too. When you chalk up the positive payback and add a hot tub to the mix? You’ll reap even more great results! Benefits for the heart. Multiple studies have been done regarding mindfulness meditation that show greater reductions in systolic and diastolic blood pressure, helping people susceptible to heart disease. If you’re in the heart healthy category, meditating can improve respiratory sinus arrythmia. This variation in heart rate in healthy individuals lends itself to a better chance of surviving a heart attack in the future. If you add a hot tub to the mix? You’ll enjoy an increase in cardiac volume by nearly a third when immersed in hot water to your neck. It imitates the benefits of a cardiovascular workout. Benefits for the immune system. 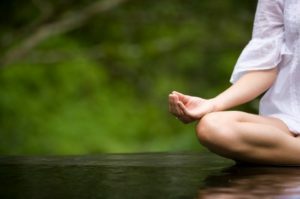 Several studies show that meditation appears to improve T-cell levels in patients with HIV or breast cancer. This points to the possibility that mindful meditation could aid in helping us fight disease and infection. If you add a hot tub to the mix? The time spent soaking outdoors experiencing nature has been shown to increase immune function. Scientists believe the reason is phytoncides. These are produced by plants to help protect them from rotting and insects, and it appears to also benefit humans! Benefits to reduce stress. One way to defend your body against physical issues is by impacting your psychological well-being. Meditation has been shown to help humans cope with all kinds of “mind pain”: anxiety, depression and stress. If you add a hot tub to the mix? Soaking in hot water elevates your mood, thanks to the resulting release of endorphins, our body’s natural feel good chemical. Your spirits will lift, you’ll feel energized and ward off headaches. You’ll also get better sleep, which in and of itself recharges your body and helps it guard against stress. It’s a wild world out there these days! We could all use some extra dedication to improve our physical and mental well-being. Consider the idea of mindful meditation and incorporating a hot tub to even further the benefits. Your mind and body will be grateful.